When Life Gives you Lemons... Lemonade pays Claims in 3 Seconds! Recently, a claim was made for a $979 Canada Goose Parka coat. After submitting the claim, the company cross-checked the policy, ran 18 algorithms to ensure no fraudulent activity was present and processed the policy deductible before transferring the final $729 claim payment into the policyholder's account. Nothing out of the ordinary there, except that this all happened within a matter of seconds. Three seconds to be exact and as such, Lemonade has the title of the fastest claim ever paid by an insurance company (self-given because it is so unheard of that international standards do not even exist for the measurement of insurance claims). As a Millenial, I think the convenience and ease that Lemonade provides is brilliant but as an insurance professional, I see the potential red flags and implications it presents. "Millenials", who are termed as those being born between the early 1980s , have now been defined the most underinsured generation in today's economy, despite holding a large majority of the buying power. Lemonade's policy for the parka coat was not only fast, it was also competitive and cheap at $5 per month and this is the winning combination. The ability to download an app, input a few details on the daily commute and instantly obtain insurance allows accessibility we have never before seen in this industry. It is a combination of innovation and technology at its finest. Lemonade's transparency of their internal processes only seems to add to their success; the company takes a 20% flat fee on profits and the remaining is invested back into the business and good causes (they currently hold reinsurance with Lloyd's of London and have a "Giveback" scheme to donate to causes their policyholders care about). Additionally, the algorithms used to pinpoint suspicious activity determine whether a claim is paid instantly or referred to a human account handler to look into further in the more traditional way. Ultimately, they appear to have covered all bases to protect both the company and policyholder whilst providing the most accessible and efficient claims process in the industry. All of this, alongside promoting a strong social footprint and transparency with the public. 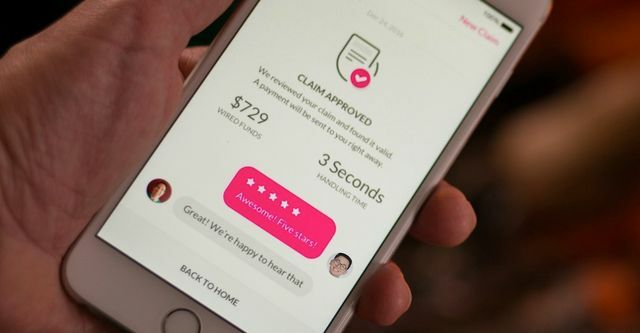 Other companies, such as Trov, are providing some healthy competition and I am looking forward to seeing what the future holds for these companies.